Killjoys label pit of ice-cream sprinkles an "environmental hazard"
During this subarctic start to 2018, we more than ever need our guilt-free, small moments of joy: labradoodle puppies videos, Porgs, and sprinkles. Except, ugh, scratch that last one. 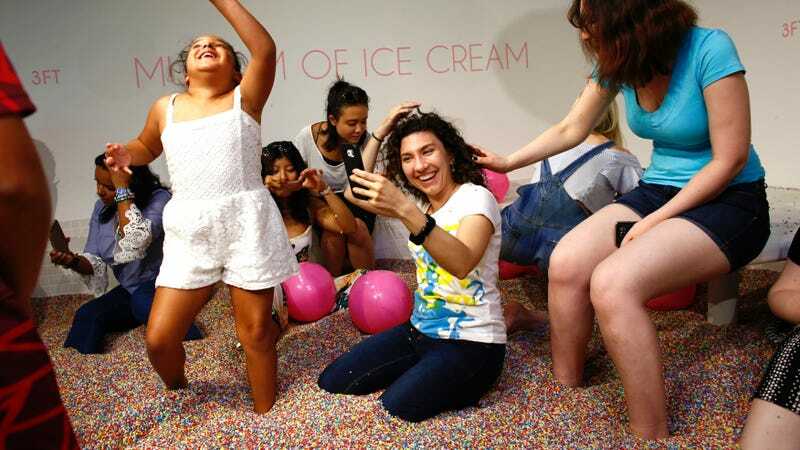 Miami Beach’s Selfie Amusement Park Museum of Ice Cream this week was fined by the city for creating an “environmental hazard” with its plastic sprinkles, Miami New Times reports. They’re part of one of the museum’s main attractions, a pit of sprinkles that look like the cutting room floor of a Katy Perry video. According to Miami New Times, city officials in Miami Beach issued the museum a courtesy notice and a sanitation violation for allowing the plastic sprinkles to litter the surrounding blocks, posing an “environmental hazard.” Environmental activists told the paper the sprinkles could be swept into storm drains, enter the ocean, and be mistaken for food by fish. The sprinkles, which are estimated to number in the 100 millions, also posed a problem in San Francisco during the museum’s stint there, SF Gate reports. An area resident claimed to have found the errant sprinkles as far as one mile from the museum. In response, the museum privately rolled its eyes (probably) and agreed to spring for a cleaning crew, sprinkle vacuums, and sprinkle checkpoints to ensure that the nefarious multicolored pills stay within its confines.